Hen Harriers come to the High Street thanks to Lush cosmetics. This week all Lush shops will have posters similar to that pictured above. 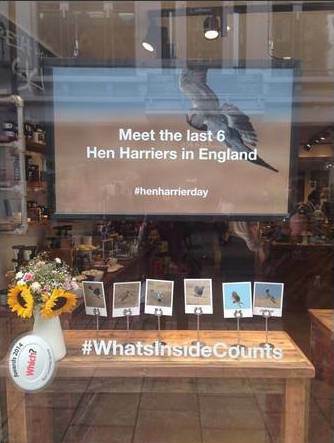 The staff are briefed and customers will be asked to show their support for Hen Harriers in a variety of ways: sign our e-petition, send a postcard to HM The Queen asking for her support. Why don’t you pop in and participate – and say ‘thanks!’ to the staff if you have a Lush store near you – you probably do. ‘The Hen Harrier’s natural habitat is heather moorlands, which are increasingly being managed by landowners as grouse shooting estates. Driven grouse moors are the most intensive form of game management and the trend for some has been to increase the shootable surplus of birds. The Hen Harrier is a natural predator of red grouse and this is why it is targeted by those in the driven grouse industry. In Wales and Northern Ireland, where grouse moor management is an uncommon land management practice, Hen Harriers are thriving. Despite being heavily protected by law and sufficient habitat on these grouse moors to support 300+ pairs of Hen Harrier, their near extinction in England proves that somehow this protection is not working. This is wonderful and exciting news, people in the high streets across England are most definitely taking notice and becoming interested in the plight of 'protected' birds of prey on moorland used to shoot red grouse. Significantly the shooting fraternity are now sitting up as a result of publicity surrounding the 3 hen harrier protest days, and of course Mark because of your petition calling for a ban of all driven grouse shooting in England. Importantly, the momentum which we are now witnessing must be maintained after the 10 August at all costs if we are to recruit more public support against raptor persecution. Mark your followers may be interested to know that together with Kevin Moore, a second member of the North West Raptor Protection Group, we have both been invited to brief Lush customers all about the plight of the hen harrier on moorland used to shoot red grouse. We will be meeting customers at two shops here in the NW of England, one in Lancaster and the other in Liverpool between 10.30 am and 4.00 pm tomorrow. We will both intermingle with customers at both shops throughout the day bringing people up to date with the reasons for the disappearance of hen harriers from the uplands of England, as well as explaining all about the 3 hen harrier protest days on Sunday. Readers can follow the link below for further details. I am optimistic that the Lush initiative inviting experienced raptor workers into their outlets to talk with customers about persecution of the hen harrier and other protected birds of prey will be successful. Perhaps this idea can then expanded to Lush shops in other regions of England in the future? Finally good luck to everyone tomorrow, I just hope the rain keeps away. What a great thing for the company to do,it is important that ordinary members of the public know what is happening and hopefully many will take issue with illegal persecution. Good for Lush. Great that a 'brand' is prepared to stick its neck out. Well done!